What is the WooCommerce Feature? What is WooCommerce? WooCommerce is one of the leading eCommerce solutions that when paired with your WordPress site gives you a lot of freedom for your online store. It’s one of the most customizable eCommerce platforms out there. On your WordPress dashboard, you’ll be able to track orders, create coupons, generate reports, and of course put up sale listings. Not only that, but all the changes you make to your store in WordPress it will update in your app’s feature in real time. If you’re looking for a more advanced version of our Shopify Feature, then you’ll find it here. If you would like to learn more about WooCommerce you can do so here. Note: While there’s more flexibility with WooCommerce, it is a more advanced ecommerce solution than Shopify, so you may want to use Shopify instead for ease of use. If you would like to learn more about our Shopify feature, we encourage you to check out this article. Before you set up your WooCommerce feature, you’ll need to set up your WooCommerce store outside of our system. In order to set up a WooCommerce store, you must have a WordPress hosted website and a WooCommerce plugin integrated into it. 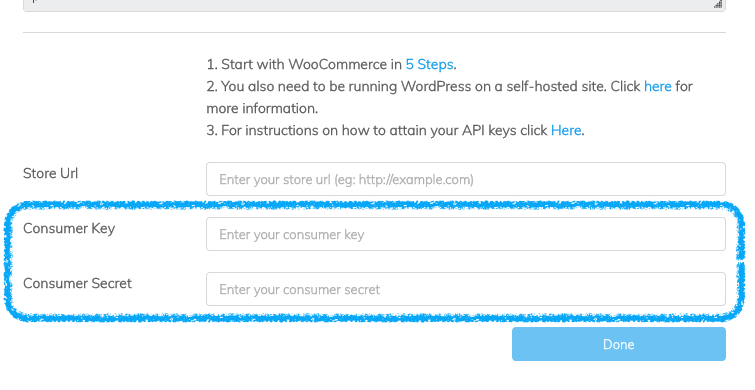 WooCommerce themselves have created a great article on how to set up your WooCommerce store in 5 steps which you can access here. Once you have set up your WooCommerce store, you will need to obtain your API keys for our system which you can learn how to do so here. Now that you have done this, let’s go over how to pair your WooCommerce store with your app though the WooCommerce feature. This information can be obtained in WordPress. To get your store URL, go to your WordPress Admin Control Panel and click on the Home icon in the top left corner of the page. This should take you to your WordPress site where you can grab your store’s URL. Copy that link and paste it into the Store URL field in the App Dashboard. 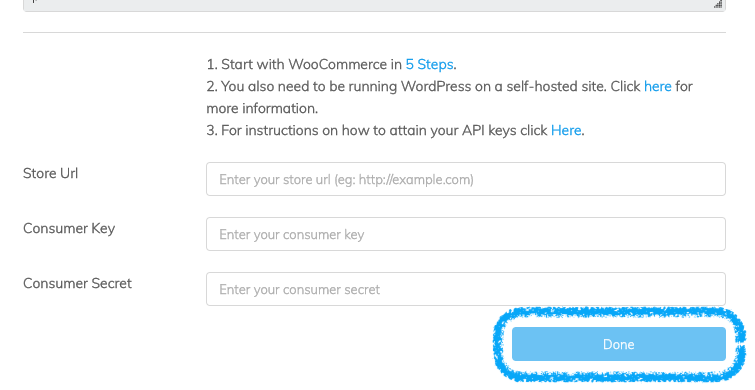 In order to obtain your Consumer Key and Consumer Secret, go back to your WordPress Admin Control Panel and go to the “Settings” section of the WooCommerce plugin. Once here, click on the API tab. then navigate to Keys/Apps. If you haven’t already done so, you’ll need to create a new key. To create a new key, click on “Add Key”. Give it a description, assign it to a user, then select “Read/Write” for the permissions. Then click “Generate API Key”. Once you have done this you should be given the Consumer Key and Consumer Secret. Make sure to copy and paste these codes into their respective fields in the App Dashboard now, as you won’t be able to access them again. After you enter in your Store URL, Consumer Key, and Consumer Secret, click “Done” and you should see your WooCommerce store show up in the App Dashboard Emulator. Congratulations! It’s that simple. Your WooCommerce feature has been created! For more information on using WooCommerce as a whole, please check out their support page. 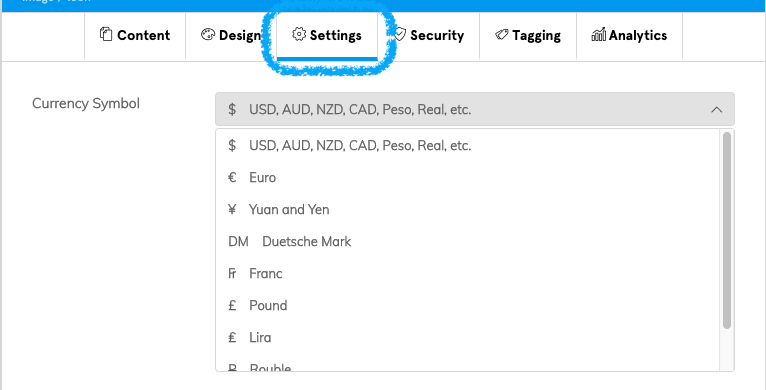 If your store is outside of the United States, you can change the currency displayed in your store by going to the “Settings” tab where you can pick from some of the most used currency forms. Thanks to the large amount of control that WooCommerce gives you over your online store, you can quickly and easily add, remove, and edit your store in the WordPress Admin Control Panel, and the best thing about it is every change you make in WordPress will appear in your app without any additional action needed!